Only one real story in tech today – Pirate Bay founders have been found guilty in their court case, jailed for a year each and ordered to pay around £1 million each. Ouch. It’s a headline grabbing verdict but only the first decision in what will will probably be a long and drawn out trial. For me it’s a symbolic victory over The Pirate Bay four rather than anything meaningful. The site won’t shut down unlike Oink which was shut down and the owner and some members charged in the UK. As of yet no one has done any jail time following the Oink arrests although some of the uploaders did receive a community service sentence and had to pay back court fee’s. The site admin of Oink has still to be tried. The biggest thing for the music and film industry bodies will be the hope that this will dissuade joe public from using torrent sites as it has ‘been proven’ to be illegal and you can be prosecuted. From what I can read today however the win does not mean the closing of the site or indeed will ever lead to the site being shut down. Pirate Bay have always been pretty open about what the do and also confident that their site cannot, and will not be shut down. Indeed, the charges that were finally proven were those of assisting in making copyright content available. Originally they were being tried of assisting copyright infringement. Very different and lesser charges. But what does assisting in making copyright content available actually mean? Where does the assistance stop? Are ISP’s assisting by providing bandwidth to those that upload and download torrents? Is Google assisting by providing torrent’s in it’s index? If so that means every search engine provider is – that’s some very big names. The Pirate Bay is a search engine with results returned of links to files held elsewhere. Is there a difference especially when I can find the same torrents on Google as I can on Pirate Bay? One impact will be not immediately, but over the next few months, we’ll see a shrinking of torrent sites. Some of the smaller sites will be shut down with ease. The ruling will have repercussions for those that aren’t set up as well as Pirate Bay or the other well known sites. I also think there will be an increase in usage at the Bay. Being THE headline on BBC News will bring the site to the attention of a lot more people. People that will be curious. Curious to see what’s there. Curious enough to visit the site. Curious enough to click on a torrent link for the first time. One final thought. Would we be using iPlayer, Hulu, Skype, Spotify and many other services if Kazza or bittorrent sites hadn’t been so popular over the last few years? Most of these are in response or based on file sharing technology. One other final thought. Would we be seeing broadband speeds of 50-100Mb now if it wasn’t for torrenting? Would we need those speeds? Last final thought. Thank goodness for newsgroups. For now. I’m a bit late to the party but now that I’m here I’m so glad I came. Spotify is a music service that, via a small local client, gives you access to a massive library of music. Legitimately. For free. The music is streamed but the quality is excellent and also very fast. This would be so so if the music library was small but it’s not. Having done deals with Universal Music Group, Sony, BMG, EMI Music, Warner Music Group and others means there is a massive amount of content. There are some noticeable absentees like The Beatles, latest Radiohead etc but that’s not a big surprise nor detracts from Spotify. So in the short time I’ve used it what do I like about it? Firstly the massive library. I’m looking for obscure tracks and more often than not you find them. The application itself is easy to use with a simple and clean interface. Reminds me of Pandora which you can’t get in the UK anymore unless you work around it’s blocks. The home page let’s you see new additions (how bad is the new U2 track?) and also see top tens from everywhere or by location. The link to the U2 track is a Spotify link – click on it to listen to the track in Spotify – a nice way of sending music to friends but not the only way. You can create playlist’s in Spotify just like you can in iTunes. 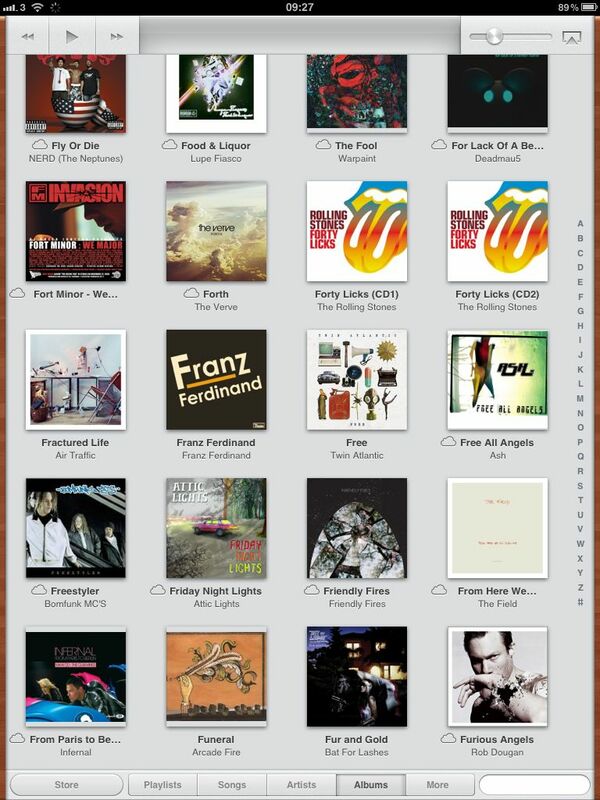 Create a playlist, search for tracks and then drag them to the playlist. Nothing too ground breaking. Once created though, right clicking on a list will allow you to select an HTTP link or a Spotify URI. You can then send the link to friends or publish on the internet. Clicking on the link will load up the playlist in Spotify – really simple and a lot better than a mixtape or best off list – here’s my tracks of 2008. Another option available is Collaborative Playlists. 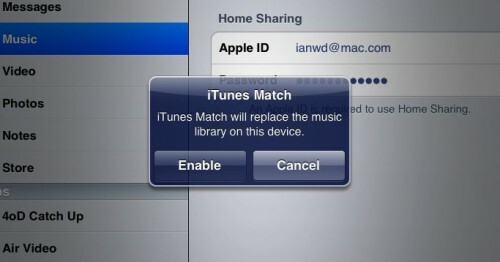 Selecting this will turn the playlist into a shared list that any user can contribute to. So at the moment I have a Lickers playlist that our gaming community can share music in and an Ian’s Inbox playlist. Hopefully other people will use that playlist to send me music that they think I will like or should try. That idea looks to have stemmed from here originally. Searching for an artist will quickly bring you to the artist page which shows their tops hits, discography and a biography. Searching for Chemical Brothers as above shows all the tracks available on Spotify from their albums and EP’s and also compilation albums that have their tracks – great for listening to similar types of music and finding new artists. Also available is Artist radio which plays tracks from the selected artist and also artists similar to them – Last.fm has much the same service. Speaking of Last.fm, Spotify client also scrobbles to your last.fm account which is handy. You can also use the Radio in Spotify which has some nice simple filters. Select a decade ot two, then select a few genre’s and press play. Great variety although with that there are some real stinkers that are selected for playback. Even though it’s a streaming service it’s quick to click on to the next track with little or no pausing between tracks. I mentioned that Spotify is free but that does mean accepting adverts being displayed in the client and also audio adverts every 10 or so tracks. So far they haven’t been distracting and are far less intrusive than the commercial radio stations in the UK. There are also two pay for access options. The Day Pass costs £0.99 and gives you ad-free access to Spotify for 24 hours. Premium costs £9.99 per month and removes the ad’s and also gives you access to a lot more invites. For now free is working great for me. While Spotify has really impressed me there’s always room for improvements? Playlist’s need folders as I can see that growing massively over time. I’d also like some more info on the collaborative playlists – highlight new tracks added, show the user who added them and how many people are subscribed to the playlist. I guess that’s the surprising miss so far – no social networking aspect. I’d have thought a friends list within the app or website would be a must – see what friends are listening too, automatically share this playlist with all friends, make a collaborative playlist friends only or public. Would become quite a powerful tool with those additions. Collaborative rating of tracks anyone? 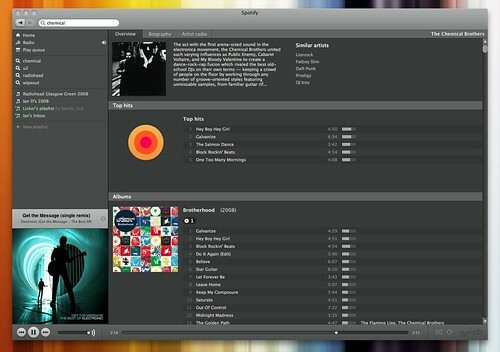 It would be fantastic to stream Spotify music to 360’s, PS3’s or DLNA supporting boxes. I’ve created some playlists on the PS3 for Wipeout. I’ve got 3 or 4 covering the original versions of the game plus a couple for new rock and electronic music. How great would it be if I could create the playlist in Spotify, be able to play that back on the PS3 and also share that list out so others could use it too. Mmmm. I wonder if I could use Connect 360, iTunes and something like Nicecast to stream Spotify to the 360? Nicecast to create the audio stream from Spotify, subscribe to it in iTunes and listen to it via Connect 360 on the Xbox 360. Might try that later today. I guess adding features would start to clutter up the client which I like due to its simplicity. No equalizer and minimal control set. 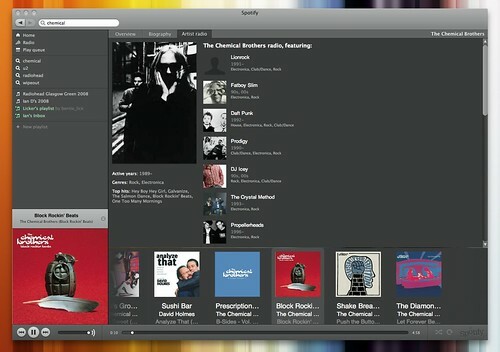 Currently Spotify is only available on Mac and PC’s. No web streaming available and no mobile client either. I think this would be great on the iPhone and offer unique features that the other music streaming app’s don’t currently offer. No official word although the support forums hint at something may be coming soon to the iPhone. Here’s hoping. 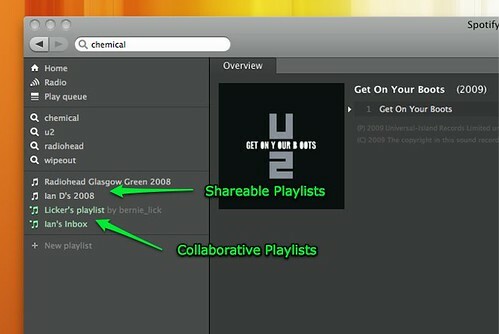 There’s also a number of web sites springing up to help with the sharing of playlists. 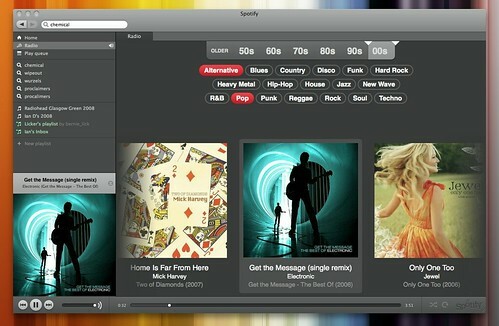 Spotifylists.com, Listiply, Spotylist and Spotyshare all offer much the same playlist sharing functionality. Topsify shares the current UK Top 40 as well as Swedish and US charts. I also have it on good authority from Windows users that Replay Music is a great way of saving mp3’s from Spotify. Not tried it myself so ymmv. Another app worth trying is Mixifier which let’s you easily share Spotify playlists with Facebook friends. Highly recommended app and service. I have a few invites left at the moment so drop a comment with an e-mail address and I’ll send out invites to whom I can. If you do join, or are already using Spotify, drop off some recommendations in my inbox.